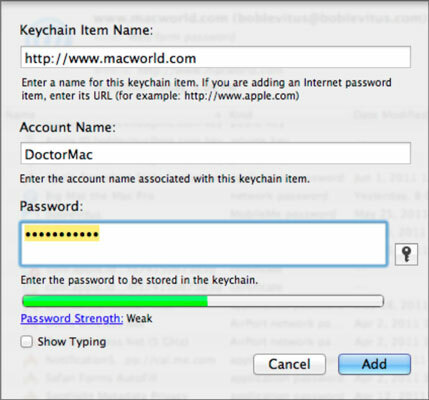 A keychain is a way to consolidate your passwords in Mac OS X Lion — the one you use to log into your Mac, your e-mail password, and passwords required by any websites. Here’s how it works: You use a single password to unlock your keychain (which holds your various passwords) and then you don’t have to remember all your other passwords. Rest assured that your passwords are secure because only a user who has your keychain password can reach the other password-protected applications. The Keychain Access utility is particularly cool if you have multiple e-mail accounts, and each one has a different password. Just add them all to your keychain, and you can get all your mail at the same time with one password. A special “master” keychain called the Login Keychain is created automatically for every Mac OS X Lion user. To add passwords for applications, just open Mail or another application that supports the keychain. When the program asks for your password, supply it and choose Yes to add the password to the keychain. How do you know which programs support the Keychain Access utility? You don’t until you’re prompted to save your password in a keychain in that Open dialog, connect window, or so forth. If a program supports Keychain Access, it offers a check box for it in the user ID/password dialog or window. To add a website password to a keychain, open the Keychain Access application, and click the Password button. In the New Password Item window that opens, type the URL of the page (or copy and paste it) in the Keychain Item Name text field; type your username in the Account Name field; and then type your password in the Password text field. To use the new URL password, use Safari to open the URL. If the account name and password aren’t filled in for you automatically, choose Edit→AutoFill Form (Command+Shift+A), and they will be. Now just click the appropriate button on the web page to log in. If you select the User Names and Passwords check box on the AutoFill tab of Safari’s Preferences window (Safari→Preferences or Command+,), you don’t have to add sites, accounts, or passwords manually. Instead, the first time you visit a site that requires an account name and password, when you log in, Safari asks whether you would like to save your password.